BREAKING: Toronto Serial Killer Bruce McArthur Pleads Guilty To First Degree Murders Of Eight Men [VIDEO] - Joe.My.God. 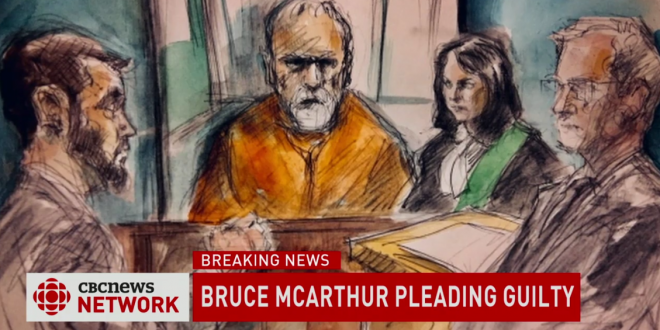 Accused serial killer Bruce McArthur has pleaded guilty to first-degree murder in the deaths of eight men, admitting to killings that began in 2010 and continued until late 2017. The plea, entered in Superior court before Justice McMahon Tuesday morning, brings to a close a tragic and disturbing case that was unprecedented in this city, and a sprawling police investigation that brought praise and ardent criticism to Toronto police. The 67-year-old self-employed landscaper — who was a familiar face in Toronto’s Church and Wellesley area, known as the Gay Village — was arrested in January 2018. Police charged him with first-degree murder in the deaths of two men, but alleged he killed others. The video below is live. BREAKING: Bruce McArthur is pleading guilty to 8 counts of 1st-degree murder in the deaths of Selim Esen, Andrew Kinsman, Majeed Kayhan, Dean Lisowick, Soroush Mahmudi, Skandaraj Navaratnam, Abdulbasir Faizi and Kirushna Kanagaratnam.